ILAM, Sept 6: Tea workers of eastern Nepal have launched a protest against tea industries following the latter's reluctance to pay them minimum wage fixed by the government. Though the government has revised the minimum wage twice, industries are still paying farmers as per the earlier wage structure. Different trade unions of tea workers started their protest on Wednesday. They say that the first phase of the protest will continue till Friday. The protest is jointly organized by Agriculture Workers Union of Nepal, Nepal Tea Garden Labor Union and All Nepal Tea Workers Union. Tea workers are staging the protest in big tea industries if Ilam, Panchthar, and Dhankuta. As part of their protest, they have planted black flags at the entrance of the industries. Earlier on August 28, they had submitted a memorandum at the Birtamod-based Labor Office to draw the attention of the government toward their demand. "We launched the protest after everyone turned deaf ears to our demand," Umesh Regmi, a trade union leader, said. "We are not demanding extra facilities. The workers only want to get rightful pay and facilities fixed by the government," he added. Announcing on August 16 the government has decided Rs 10,781 monthly salary for workers that comprise Rs 6,469 basic monthly salary and Rs 4,312 allowance. Similarly, the daily wage of tea workers has been fixed at Rs 385 (Rs 51 per hour). Published a notice in the Gazette, the government had said that new pay structure will come into effect from the first day of the new fiscal year i.e. July 17. But the new pay package is yet to be implemented, say, workers. The government has been revising the basic salary of tea workers every two years. But such pay hike is limited to papers only as workers have not received wage raised two years ago as well. Although the pay structure announced in 2016 has been implemented by privately-owned tea plants and gardens, government-owned plants and gardens have not implemented it yet. 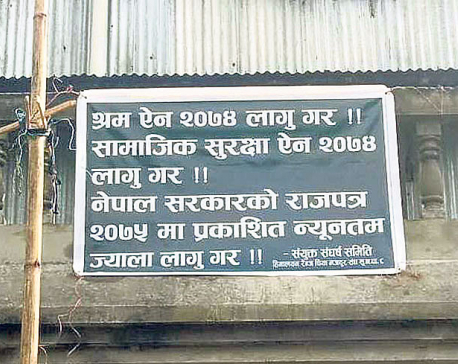 Talking to Republica, Bishnu Bhattarai, another worker leader, said tea workers are receiving only Rs 279 per day even though the government has fixed daily wage at Rs 308. The workers say they will not hamper works at tea gardens and industries till Friday. 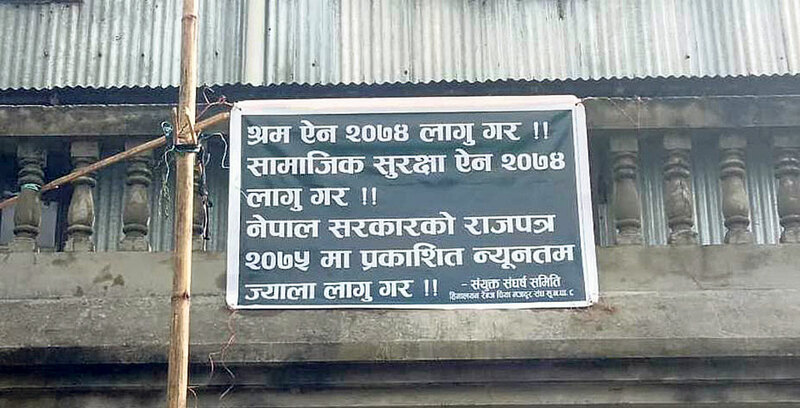 "But if they (industries) do not revise our wages by Friday, we will be forced to announce new protest programs," Ramesh Khadka, another worker leader, said. Along with the implementation of the new pay package, tea workers have also demanded that their employers give them facilities like job contract, insurance, leave and medical facilities, among others, enshrined in Labor Act 2017, Labor Rules 2018 and Social Security Act. The Act also states that workers are entitled to receive a festival allowance equivalent to one month salary and provident fund, among other facilities. The government has four tea gardens in Ilam and three more in Jhapa. These gardens have been leased out to Triveni Sanghai Group since 2000. There are 16 big tea industries in Ilam, 69 in Jhapa and six in Dhankuta. There are a total of 108 big industries and tea gardens across the country, according to a study conducted jointly by Nepal Tea and Coffee Development Board and Central Bureau of Statistics. Meanwhile, promoters of tea gardens and industries say that it will be difficult for them to implement the revised pay package. "We are not implementing the new wage structure, as the government took the decision without holding any discussions with us," an industrialist told Republica.